"Let's put his head in the vise and yank it off." 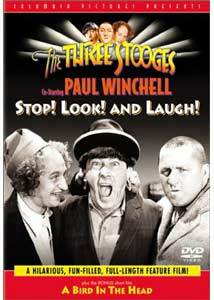 It seems difficult to imagine that someone, with access to the complete Three Stooges library, could assemble a dreary package of compilations, but producer Harry Romm managed to do that with this misbegotten effort. Produced to capitalize on the Three Stooges' renewed popularity on television in the 1950s, this hastily assembled theatrical feature contains clips from ten of the 97 shorts with Curly, but the selection is dubious and the extraneous material added in as padding is downright painful. The framing story features a day in the life of ventriloquist Paul Winchell (as himself), with his dummies Jerry Mahoney and Knucklehead Smiff. First Mahoney doesn't want to go to school, then Knucklehead needs tutoring. Later, Knucklehead is a short order cook messing up the short orders. Along the way, crude segues lead to clips from the Stooge shorts. As if this weren't jarring enough, the concluding segment features Winchell telling Mahoney the story of Cinderella, as enacted by the Marquis Chimps. Yes, this is so bad they had to bring in monkeys. But it doesn't help. The only positive that can be granted this segment is that the great June Foray (uncredited) does the voices for most (if not all) of the chimps. The Stooge clips include some decent high-rise welding bits from How High is Up (1940), some gas station mayhem from Violent is the Word for Curly (1938) and a chase segment with a foundling from Sock-a-Bye Baby (1942). Some rough material from Higher than a Kite finds Moe getting his head stuck in a pipe as Curly and Larry attempt to get it out, and Curly in the title role of What's the Matador (1942) while Moe and Larry make up the bull suit. A highly abridged version of the dog veterinarian story, Calling All Curs (1939) is present, as is most of the classic Micro-Phonies (1945). A good segment of hapless pipe work from A Plumbing We Will Go (1945) is entertaining enough. A short bit featuring yet another monkey from Goofs and Saddles (1937) is the earliest of the bunch, while Half-Wits Holiday (1947) represents the final Curly short; his debilitating stroke midway through production left large segments (many present here) where only Moe and Larry are present. Weirdly, even though longtime Stooge writer and director Jules White is credited with the overall direction of the feature, many of the clips are not among the Stooges' best work. Indeed, the violence quotient is extremely low, with most of the eye gouging and slapping snipped. A mere eight conks to the head, one eye poke and about a dozen punches (most of them in the Calling All Curs clip) are the extent of the violence, which is only about enough to make up a mediocre Stooge short and doesn't begin to fill up a feature with the required dosage of mayhem. To make matters worse, the composer for the film has added inappropriate background music to the Stooge clips. This amounts to nothing less than downright vandalism. Although Winchell can be entertaining, the writing for his segments is sloppy and lackadaisical and will be found to be entertaining only to moderately dull small children. To make matters worse, Mahoney is seldom on screen together with Winchell, making the use of a ventriloquist questionable (of course, I could never figure out how Edgar Bergen and Charlie McCarthy merited a radio program either). One segment with Knucklehead Smiff does nicely demonstrate Winchell's skills as he voices the dummy while clenching a pipe in his teeth. Although an accumulation of Stooge clips has the potential to be terrific, this mess is sadly not it. The Stooges sued Columbia over the film, which was released without their approval (or payment); they might have also added harm of reputation to the suit, which was settled out of court in 1962. In all, a most unfortunate episode in the history of the Stooges. Image Transfer Review: Although the film as released in 1960 was a widescreen production, the original Stooge shorts were in Academy ratio. The result was a tilt and scan version of the shorts, cropping and occasionally moving the frame to accommodate the action. Generally, this is not too destructive, though in Half-Wits Holiday the tops of heads are cut off. The original material looks fine; the Stooge clips are in mixed condition but generally acceptable and typically no worse than on the Columbia discs of the Stooge shorts. Audio Transfer Review: The 2.0 mono is generally quite clean and free of noise, even on the older Stooge material. The music sounds adequate for the period, dialogue comes through fine and the sound effects have good presence. Winchell's segments generally sound slightly better than the older Stooge clips, but as a whole it's quite acceptable. Extras Review: There's only one extra, but it's a good one: the Stooges' opus A Bird in the Head (1946), presented in its proper full-frame aspect ratio. In keeping with the monkey theme, there's a gorilla suit here too, as mad Professor Panzer (regular Stooge foil Vernon Dent) seeks to transplant a smallish brain into the ape. Of course, Curly fits that bill quite nicely, and mayhem results. The boys start off as paperhangers, which while preventing the plot from getting started leads to some very funny business in the boys' general obliviousness. With 16 slaps and 19 conks to the noggin, this is by itself more violent (and more entertaining) than the main feature. The short is in very good condition. Other than subtitles in several languages, there is decent chaptering, with the chapter titles allowing one to go directly to the listed Stooge shorts. An expurgated accumulation of clips that aren't among the best Stooge material, and there's far too much extraneous material (what the heck are these chimps doing here?) for any serious Stooges fan. The only reason to pick this up is for the bonus short, A Bird in the Head.